Pasta! Can’t deny it. I’m a sucker for some good pasta or noodles of most any type…even of the squash variety. It’s a comfort food that has the innate ability to just make you feel happy and remind you of good times with friends and family, at least I think so. On a commercial promo that plays on the Cooking Channel, there’s a guy that says something like, “When I want to feel happy, I go grab a cheeseburger.” For me, it’s noodles! And its so fun to make too! When I was a kid, I had a lot of fun making noodles for Miki Nilad-dit (another type of Filipino chicken noodle soup) with my dad, so I’ve always enjoyed making them. Lately, I’ve been enjoying experimenting with kamut flour and whipped out my pasta gear and made some fresh kamut pasta. Here’s the pasta dough portioned out and ready to roll. I just love the golden-hue that kamut (khorasan) flour gives to dough. For a nice homemade fresh pasta guide + recipe, click over to David Lebovitz blog. The pasta gear includes my KitchenAid mixer and the pasta roller attachments. 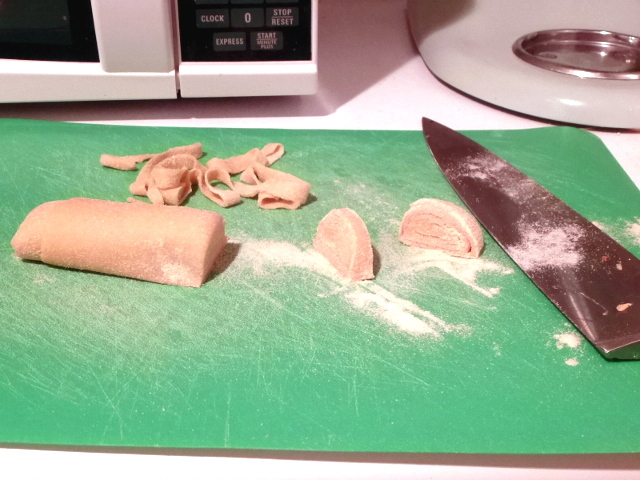 Or you can go without any fancy equipment and just use a rolling pin and get very thin pasta sheets. Whatever equipment you use, just make sure that the pasta is always well floured so things don’t stick. I’ve done that before and it ain’t pretty (the words grumbling out of my mouth). This is how we made noodles when I was younger. 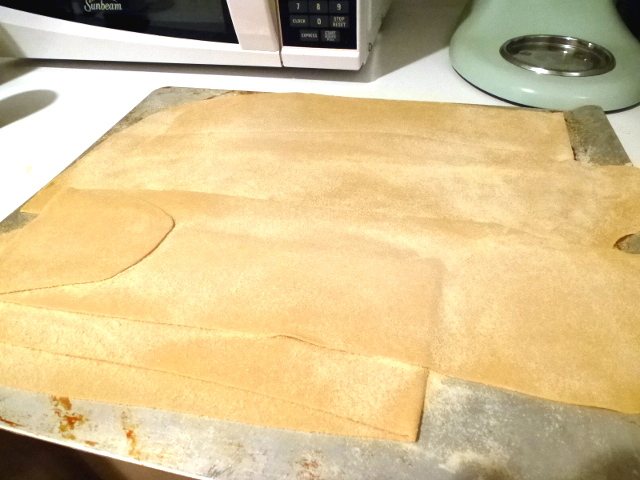 Roll a floured pasta sheet tightly, then cut with a sharp knife. A little time consuming, but it was fun cooking with my dad. Lovely golden-hued kamut pasta. Don’t worry if the pasta doesn’t look perfect. It’s a reflection of how life is. Life ain’t perfect so pasta doesn’t need to be, LOL. I’ve made kamut pasta using the traditional basic pasta method with eggs (recipe at the end of the post) and also a soaked (fermented overnight) version from Gnowfglins. I really like the soaked version which doesn’t require any eggs. The only drawback to the latter version is that the pasta is a little more delicate and prone to breaking, so it’s important to handle it carefully and gently. In theory, soaking reduces phytic acid, a molecule present in grains that binds to minerals, preventing absorption in the body. So, soaking may be a good thing to unlock the minerals for the body to use. Any readers out there know more about this? Feel free to share your knowledge on phytic acid, lectins, etc. below in the comment box! Now that we have the noodles almost ready, what are we going to do with them? A couple of weeks ago at Magnone Trattoria, one of my favorite Riverside, CA restaurants, a good friend (Suraj aka JENTINA!) and I went out for lunch and had this is superbly-delicious pasta dish with seasonal vegetables (though I had gluten-free pasta). If you ever find yourself in that town, Magnone is a must-try. I particularly like their fresh flavors reminiscent of the seasonally and locally-minded cooking in eateries of San Francisco and the Bay Area. They use veggies and herbs from their garden too! Inspired by this vegetable pasta dish, I wanted to pair my kamut noodles with some nice veggies, not anything too complicated. 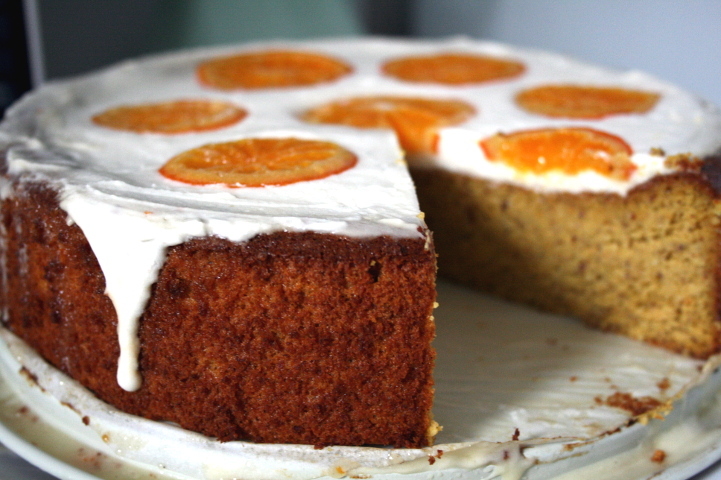 Simple, fresh, easy, and most importantly, so good to make you feel warm and fuzzy inside. This dish that I present here is a riff off of my ya mein recipe, but instead of a peanut sauce, I used an almond -based sauce. I think the nutty flavor goes really well with the kamut. Baby broccoli (or from the regular large heads) and carrot are a good pair and are nice in stir-fry type dishes. I just love the leafier varieties of broccoli! Also, if you get certified organic carrots, you don’t need to peel them. Just wash and its ready to use. More good stuff is in the carrot peel anyway, hehe. This would be great as a side, with some type of protein, or as is! With a bowl of these noodles, it’s happy time! LOL. Make the almond sauce: Whisk together all of the ingredients (soy sauce, almond butter, almond oil, honey, red pepper, and salt & pepper. Set aside. Heat a skillet on medium-high heat. Add the oil and swirl to coat the pan. Stir-fry the carrot for 1-2 minutes. Mix in the baby broccoli. Turn off the heat and gently mix in the kamut noodles. Add the almond sauce and toss everything together. Garnish with sliced green onion and some sliced or slivered almonds. Make the dough: To mix the dough by hand, place the flour on a clean countertop and make a crater in the middle of the mound of flour, creating a flour volcano. Crack the eggs into the middle of the crater and beat the eggs using a fork, gradually incorporating the flour into the volcano. Keep mixing until you get a lump of dough. Alternatively, you can use mixer on low-medium setting with a paddle attachment by adding the eggs to the flour until combined and you get a smooth dough. Knead the dough with your hands for 8-10 minutes until you get a smooth elastic dough. Add water, a tablespoon at a time, if the dough is dry. You want the dough to be slightly tacky, but not enough to stick to your fingers. Add a bit of flour if it is too sticky. Shape the dough into a nice ball. Let dough rest at room temp. for 30 minutes to an hour. (This resting step is important for a good texture). Divide the dough into 6-8 portions. Shape the pasta using a pasta maker, or use a rolling pin to get a thickness about 1/16 inch thick or as thin as you prefer. Lightly flour the pasta sheet and roll the sheet as if you are making a jellyroll/cinnamon roll. Cut into strips ~1/8 inch wide for linguine or ~1/4 inch wide for fettucine. Unfurl the noodles and lightly flour to prevent pasta from sticking together. Let the pasta air-dry about an hour until ready to use. You can cook it immediately without drying. To use later, wrap pasta well and keep in refrigerator for up to a couple of days or freezer for a couple of weeks. Cook pasta: Heat about 6 quarts of water (per pound of pasta) and a bunch of salt (1/2 tablespoon per quart) to a boil. Add pasta, stirring to loosen the noodles and prevent sticking. Cook, stirring occasionally, for 3-7 minutes until al dente, but not mushy. 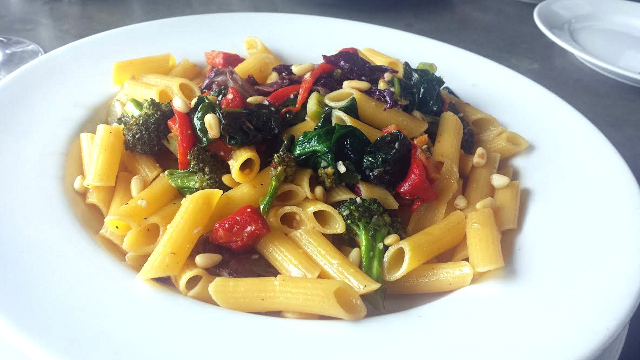 This entry was posted in Cooking, Food, Recipes and tagged almond butter, baby broccoli, carrots, kamut noodles, kamut pasta, Khorasan wheat, KitchenAid, Magnone Trattoria, Noodle, Pasta, stir fry noodles, stir-fry, tamari. Bookmark the permalink. The almond sauce looks delish (and versatile)! Thanks. The sauce can definitely be used in other dishes too! Glad that I found your blog. Kamut flour is fun to work with and it’s just delicious.